Back in the dark ages, when I was using Windows I tried both Google Desktop search and Coppernic Search. In Linux I have tried using beagle. All these software are great – but the had one common limitation – you cannot limit your search to just one folder. This feature is really important for me. Just yesterday, I found a new desktop searching application for linux – Recoll. Recoll has that feature. I don’t blame the other software for not having the folder search option. 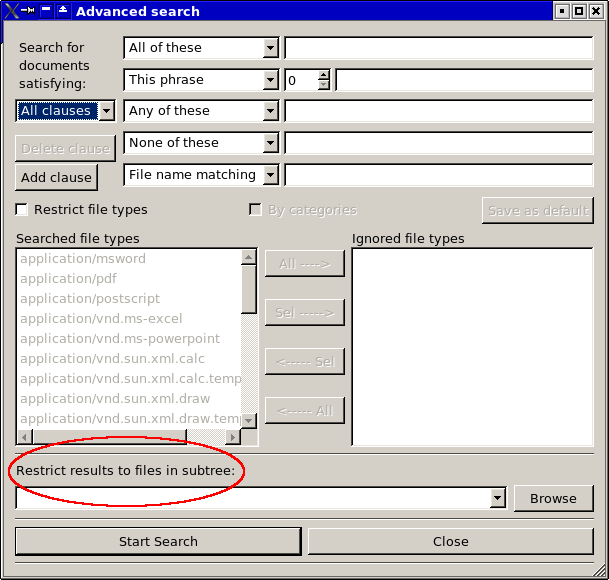 Its actually a feature – desktop search applications want to remove the concept of folders and files. They want to abstract away that layer – now all you have is information – available to you via a search interface. Unfortunately, that’s not what I want. If you are unsatisfied with beagle and is looking for a more advanced desktop search application, Recoll is for you. Recoll supports advanced search options like filename and content search, text negation, text phrases and more. What I like more than anything is the ability to search within a given folder. If you know a bit of HTML, you can modify the looks of the result pages. Searching is very fast. Indexing speeds are decent. However, if you have enabled icon display for results, there might be a flickering when showing the results. Like all other searching softwares that uses index, Recoll demands a huge storage space to keep its index(1.8 GB in my case). This is not much of a problem for me as I have a 160 GB HDD. But for people with smaller harddrives, this could be a problem. I had some issues when using the software – especially when indexing. When I tried to close the application when it was indexing, it refused to quit. I had to kill it – and that corrupted the index. If I want to index a folder other than ‘~’, there is no dialog box where I can set this option. It can be done – but I have to edit the configuration file for that. Not a problem for me – but for new users, it could be a problem. All the problems listed above will be solved in a little more time. The software is relatively new – so it is entitled to a few bugs.